I was just curious, why people are not paying enough attention on Microsoft PowerPoint slideshows, when it comes to Social Media Marketing tactics. Many believe, social media marketing is only possible with blog posts, forum threads, RSS feeds, photos and videos. But, did you imagine how powerful a simple PowerPoint show could be when it comes to ignite a massive marketing exposure to your brand, idea? Just imagine how many PowerPoint shows are in circulation all over the world as email attachments. What if one of those PowerPoint shows, associated with your brand, and/or a non-profit idea that you wanted to share with the entire world? First thing is, you need to create a powerful PowerPoint show, which attract people’s attention. Once you done that, next step is to get it across to an initial audience. If, your initial audience is happy about your show, they will volunteer to do the marketing for you. (Typical Social Media Marketing). Now, how do you get your PowerPoint show, across to your initial audience? Well, you may heard, read, shared a million of articles on “power of youtube” for Video sharing and “flickr” for photo sharing, but many has under estimated the power of similar services for sharing PowerPoint shows, on the internet. Here are some of the popular and upcoming services on the internet, for sharing PowerPoint shows. 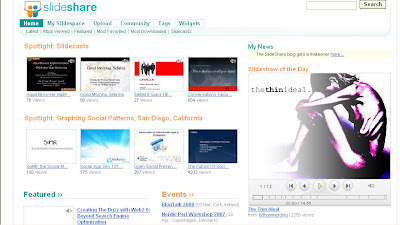 SlideShare.net is arguably the best of the kind, so far, and they have been in the seen for quite a some time now. Its interface is very much similar to Youtube, and the slide responds extremely fast compared to some other services listed below. If you are smart enough, you can attract thousands of viewers to your PowerPoint show. Tagging and effective titles are the key to grab attention on viewers. When you submit a PowerPoint to Slideshare.net, always make sure you tag it properly. Use as much as relevant tags. If your PowerPoint show is catchy enough, people may tend to download it and share it among friends as email attachments. The potential for viral marketing is unlimited thereafter! 1) They don't allow hyper linking inside slides. 2) There is no “download as PPT/PPS” option. 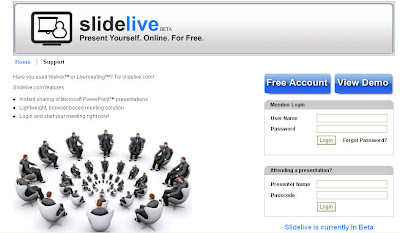 Allowing people to download as PPT is a great advantage you get with Slideshare.net. 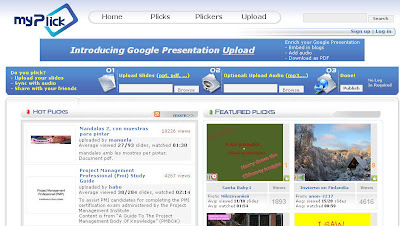 That will boost the viral effect you could get by uploading your PowerPoint show to the internet. SlideLive.com is another beta testing site, but it's bit different from the above two. SlideLive try to compare themselves more with Web based meeting services like Go to Meeting and WebEx. They give you the flexibility of selecting from 3 methods of uploading your PowerPoint shows; private, public and invited. In the invited mode, you can enter a password to view and download the show, and only those who invited by you, would be able to view and download the show. And they are a Beta test, by the definition of word! You get error messages saying "our servers are experiencing some problems, and please try in few minutes" a lot of the time. MyPlick.com is on of the new finds for me. It's pretty much similar to SlideShare and AuthorStream, but slightly better than AuthorStream. ScreenCast not only allows you to share PowerPoint show, but any thing from a Video to flash file you can share on Screen cast. But, unlike other services they charge a fee, to use their service. So, if you are looking for a free tool to upload and share your PowerPoint shows, this won't be an option. Thank AMI! Exactly what I was looking for. Thank you very much for the information and websites. This has helped tremendously, and I agree. People should begin utilizing PowerPoint Presentations better on the net.